Now is a good time to start thinking about the beginning stages of organizing your yearbook. The Ladder Stage! We know, we know, it’s not NEARLY as exciting as picking candids or deciding on yearbook theme ideas. But it is an essential part of the yearbook creation process and will make your life a whole lot easier after it’s done. You will want to develop a page ladder that shows what is to go onto every page of your yearbook. The ladder will help determine how many pages to allocate to each specific activity (portraits, sports, organizations, academics, advertisements, student life, etc.). The ladder will also help you organize the sequencing of sections to give a nice flow to your yearbook. Your ladder can also be used as a checklist during the year to help track progress. To get started, determine the approximate number of pages you will need in the book. This may have already been determined upon your sign-up. If not, base this information on the number of students and staff members, number of grades, extracurricular activities and other activities you might want included in the book. Remember to work in increments of four pages unless you are ordering a Smyth sewn book where you’ll need to work in increments of 16 pages. Determining what will be on every page of your yearbook can be challenging at first. 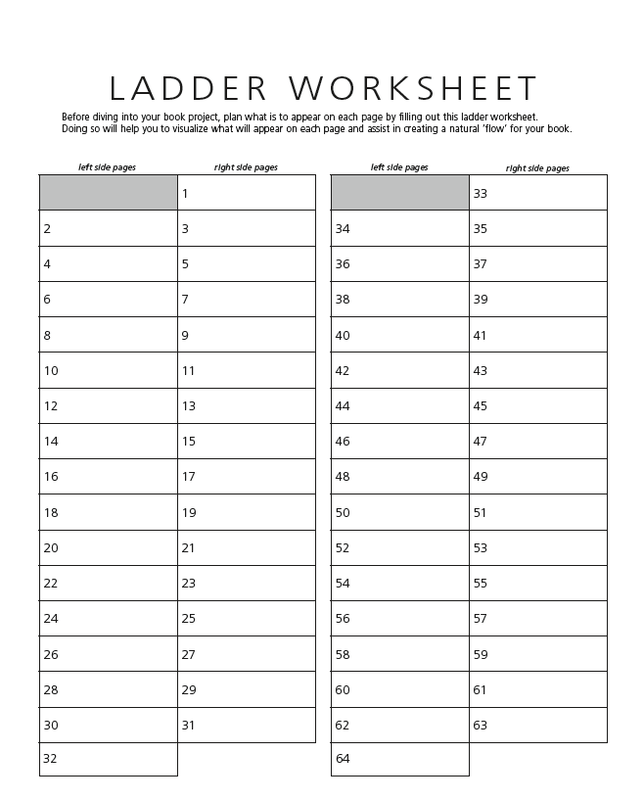 Use the desk-size ladder worksheet (need one? download one here) to brainstorm what you think should be included and in what order. Share this with other relevant faculty and students to ensure every event and group has appropriate coverage. Once you have a good idea, put your pagination onto your large wall ladder to track progress. Hang your large wall ladder in a prominent place in the room where your yearbooks staff meets. On it you can display the pagination, assign students to their pages, set deadlines, track progress and include pertinent notes. Keep in mind, what you can include is often determined by when you want your yearbook to arrive. If you want to receive your yearbook before graduation, choose Spring Delivery. This will require your book to be completed and submitted earlier in the year. To include events that happen after you have submitted your book for publishing, a supplement is a great way to provide additional coverage. (Just check with your yearbook provider for details on supplements.) If you want the entire school year included in the yearbook, choose Fall Delivery. This allows your submission deadline to be in the summer and your yearbooks will arrive after school reopens in the fall. Figuring out what will be on every page can be daunting. So we've included a list of yearbook content ideas to help you determine what sections to include in your yearbook. We gleaned from thousands of yearbooks to come up with this sample list so if it’s missing something or you have an awesome idea for a section…let us know! We’re sure other schools will appreciate your insight as well. So how many pages should you allocate for each section? That is completely up to you! And completely dependent on what you are including. But don't stress. You don't have to have that all set in stone right now. The same goes for the order of your sections. You can choose any order for the sections in your book. That’s part of the fun of making it unique! But it doesn't have to be concrete this early in the game. For now, just focus on getting the sections determined and a rough estimate of pages allocated. You can always change the order and content later, even after the pages are already laid out. Have fun getting started on your yearbook!